The Muslim population in sub-Saharan Africa is projected to grow by nearly 60% in the next 20 years, from 242.5 million in 2010 to 385.9 million in 2030. 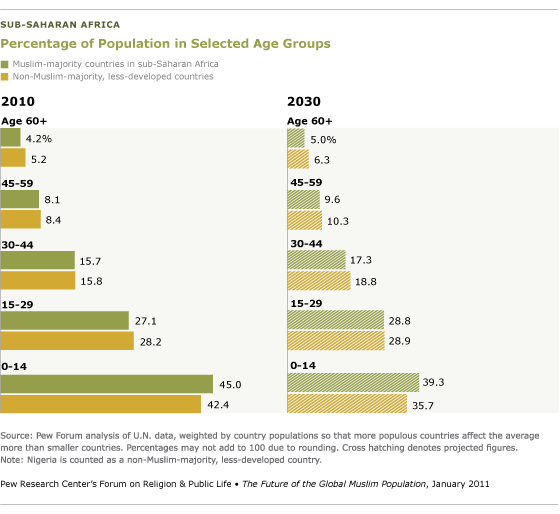 Because the region’s non- Muslim population also is growing at a rapid pace, Muslims are expected to make up only a slightly larger share of the region’s population in 2030 (31.0%) than they do in 2010 (29.6%).30 However, Muslims in sub-Saharan Africa will account for a growing share of the global Muslim population. By 2030, 17.6% of the world’s Muslims are expected to be living in sub-Saharan Africa, up from 15% in 2010. 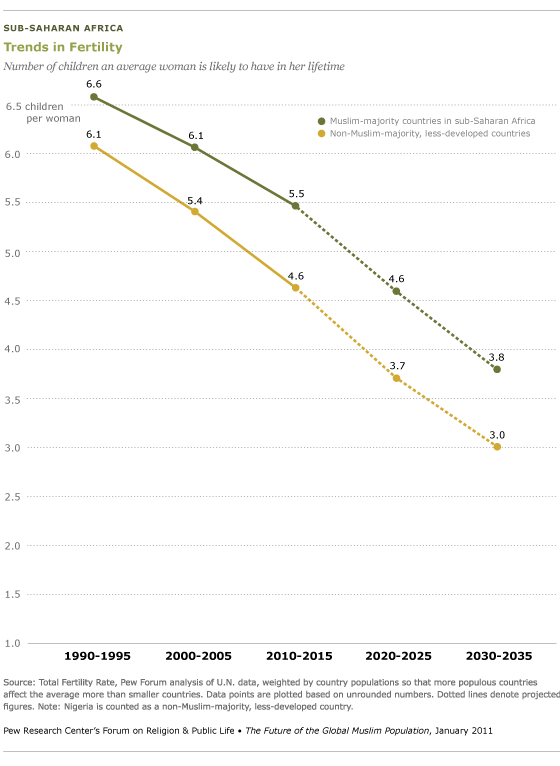 The increase in the number of Muslims in sub-Saharan Africa is projected to be greater in the next 20 years than it was in the previous two decades. From 1990 to 2010, the number of Muslims in the region increased by about 103 million. 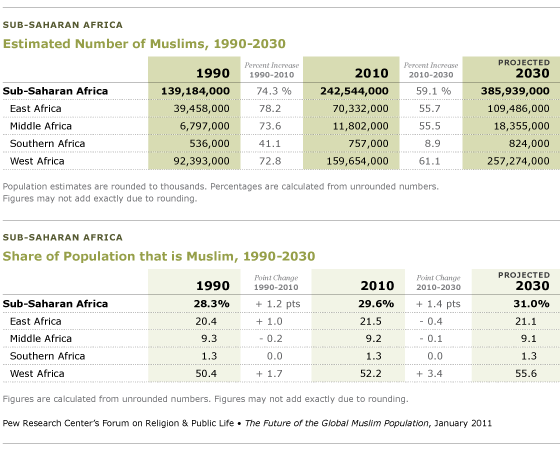 In the next 20 years, the number of Muslims in sub-Saharan Africa is projected to increase by about 143 million. During the 1990s, sub-Saharan Africa’s non-Muslim population grew at a slightly faster rate than the Muslim population. From 2000 to 2010, however, Muslim population growth in the region surpassed the growth of the non-Muslim population, largely because of Muslims’ higher fertility rates (see page 112). 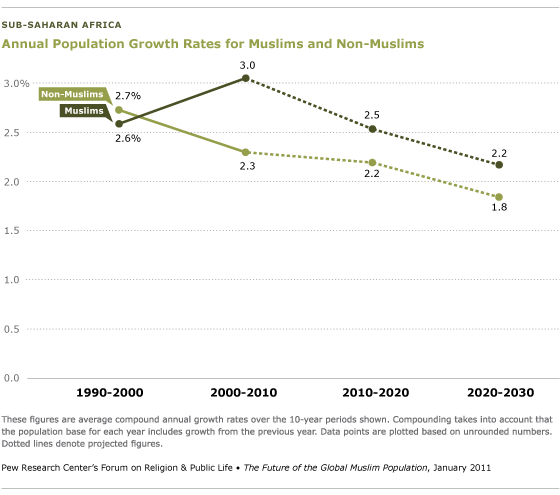 From 2010 to 2030, the growth rate of sub-Saharan Africa’s Muslim population is expected to more closely mirror the growth rate for non-Muslims in the region. The Muslim population of East Africa, which includes Ethiopia, Kenya, Tanzania and Uganda, is projected to increase from 70.3 million in 2010 to 109.5 million in 2030. Over the same period, however, the share of East Africa’s population that is Muslim is expected to decline slightly, from 21.5% to 21.1% in 2030. Muslims account for less than 10% of the population in Middle Africa, which includes Cameroon, Congo and the Republic of Congo. 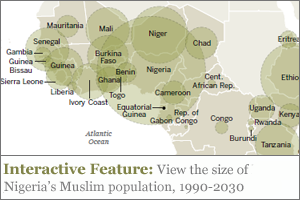 The Muslim population in this part of Africa is expected to increase from 11.8 million in 2010 to 18.4 million by 2030. The Muslim share of the population is expected to remain at roughly 9%. Southern Africa is forecast to have roughly the same number and share of Muslims in 2030 as in 2010. The Muslim population is expected to increase slightly, from 757,000 in 2010 to 824,000 in 2030. 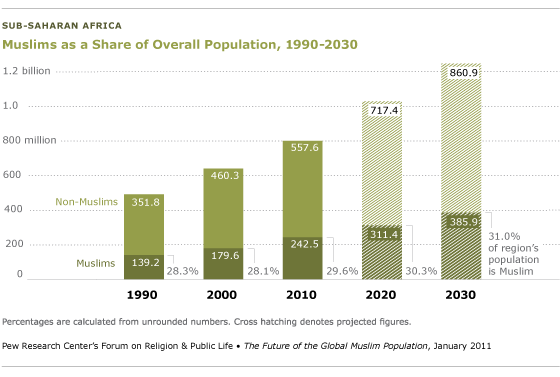 The Muslim share of Southern Africa’s population is projected to remain at 1.3%. Nigeria’s Muslim population is expected to increase by more than 41.1 million from 2010 to 2030, rising from 75.7 million in 2010 to 116.8 million in 2030.32 This is by far the largest projected increase in sub- Saharan Africa. 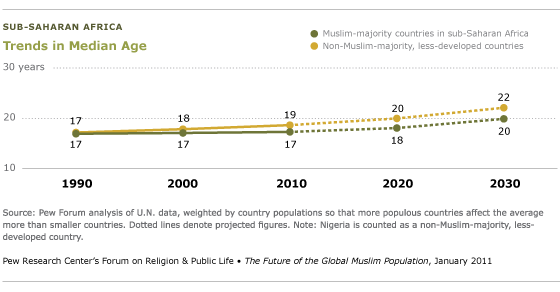 As noted earlier in this report, Nigeria is projected to become a Muslim-majority country by 2030. Of the nine other countries in the region that are expected to have the biggest increases in the number of Muslims, six are Muslim-majority – Niger, Burkina Faso, Mali, Senegal, Somalia and Guinea. Niger, which is expected to have the second-largest numerical increase in the size of its Muslim population, will also have the largest percentage increase in the number of Muslims. Its Muslim population is expected to increase by more than 100%, from 15.6 million in 2010 to 32 million in 2030. Two countries with relatively small Muslim populations – Rwanda and Gabon – are among those expected to have the greatest proportional increases in the size of their Muslim populations over the next 20 years. Rwanda’s Muslim population is expected to increase by 92.8%, from 188,000 in 2010 to 363,000 in 2030, while Gabon’s Muslim population is expected to increase by 68.2%, from 145,000 to 244,000. In addition to Nigeria, Ivory Coast, Gabon and Ghana are expected to have the largest increases in the share of their population that is Muslim. 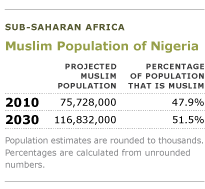 The projected increase in Nigeria’s Muslim population is primarily due to high fertility rates. Although the rates vary considerably throughout the country, the average fertility rate for Muslim women in Nigeria is between six and seven children per woman, compared with an average of five children per woman for non-Muslims. High fertility rates among Nigeria’s Muslims are related to factors such as lower levels of education and lower use of birth control. According to a Pew Forum analysis of the 2008 Nigerian Demographic and Health Survey, the percentage of women of childbearing age who cannot read is three times as high among Muslims (71.9%) as among non-Muslim Nigerians (23.9%). Muslim women of childbearing age are also much less likely to have received a formal education than are other women in the country; 66.0% of Muslim women have no formal education, compared with 11.2% of non-Muslims. Only about 3% of Muslim women in Nigeria have attended college or university, compared with roughly 14% of non-Muslim women. According to the 2008 Nigerian Demographic and Health Survey, Muslim women in Nigeria marry more than three years earlier on average than non-Muslim women (15.9 years for Muslims, compared with 19.5 years for non-Muslims). Also, 81.3% of Muslim women say they do not intend to use birth control, compared with 51.2% of non-Muslim women. Geographically, Muslims are more concentrated in the northern part of Nigeria and Christians in the southern part, while the mid-section of the country is more religiously mixed. Fertility rates in sub-Saharan Africa – both in Muslim-majority countries and non-Muslim-majority countries – are among the highest in the world. Women in Muslim-majority countries in the region have, on average, more than twice as many children as women in Muslim-majority countries in the rest of the world.33 They also have about one child more on average than women living in non- Muslim-majority countries in sub-Saharan Africa. 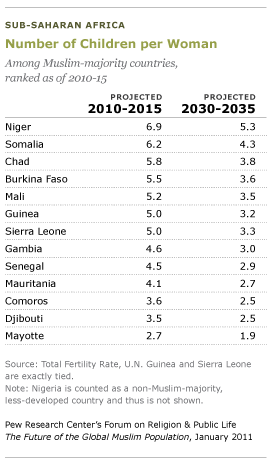 Fertility rates in Muslim-majority countries in sub-Saharan Africa are expected to decline in the next 20 years. But the declines will likely not be as large as the declines in Muslim-majority countries in other regions of the world. As a result, Muslim-majority countries in sub-Saharan Africa are still expected to have some of the highest fertility rates in the world in 2030 (an average of 3.8 children per woman in 2030). Among the 13 Muslim-majority countries in sub-Saharan Africa, Chad, Somalia and Burkina Faso are expected to have the greatest declines in fertility in the next 20 years. 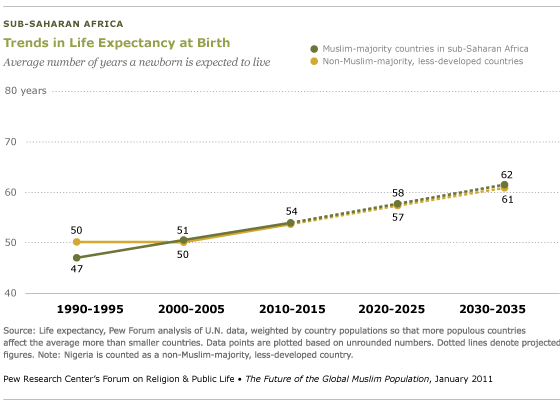 In the next 20 years, Muslim-majority countries in sub-Saharan Africa collectively are projected to have bigger increases in life expectancy at birth than Muslim-majority countries in any other region, primarily because of advances in health care and living standards. As recently as 1990-95, average life expectancy at birth in the region’s Muslim-majority countries was only 47 years. Today, average life expectancy at birth in these countries is 54 years. By 2030-35, it is expected to be 62 years, a 15-year increase from 1990. If current trends continue, life expectancy at birth in the region’s Muslim-majority countries will narrowly surpass that in non-Muslim-majority countries within 20 years. Among the possible reasons for this is that Muslim-majority countries in sub-Saharan Africa have a lower prevalence of HIV than non-Muslim-majority countries in the region. Although HIV may be underreported in some Muslim societies, this study’s analysis of 2009 data from the U.N. finds that less than 2% of people ages 15-49 in Muslim-majority countries in sub-Saharan Africa are HIV positive, compared with nearly 6% of the population in non-Muslim-majority countries in the region. Average life expectancy at birth today varies significantly among the 13 Muslim-majority countries in the region, from a high of 76 in Mayotte, in East Africa, to a low of 49 in Sierra Leone, in West Africa. Niger, also located in West Africa, is expected to have the biggest increase in life expectancy at birth (nine years) in the next 20 years. Life expectancy is often influenced by economic conditions, such as income levels and purchasing power. 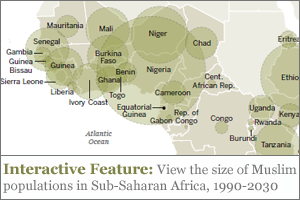 Sub-Saharan Africa is a poor region relative to the rest of the world. Both Muslim-majority and non- Muslim-majority countries in the region have considerably lower gross domestic products (at purchasing power parity) than the world median of $6,600. But Muslim-majority countries in sub-Saharan Africa have slightly lower median per capita GDPs ($1,200) than non-Muslim-majority countries in the region ($1,500). Muslim-majority countries in sub-Saharan Africa are losing far fewer people today as a result of emigration than they did in the early 1990s. From 1990-95, these countries lost an annual average of nearly 500 people per 100,000 in the general population, largely as a result of conflicts in Sierra Leone and Somalia. Muslim-majority countries in sub-Saharan Africa now lose an average of 108 people per 100,000 annually through emigration. Loss from migration is projected to decline to 56 people per 100,000 annually by 2030-35, equal to the loss from migration projected for Muslim-majority countries in North Africa. Mali now has an annual net loss of nearly 300 people per 100,000,which works out to more than 38,000 people per year. Chad has an annual net loss of nearly 200 people per 100,000, which works out to more than 22,000 people per year. The population of sub-Saharan Africa – both Muslim and non-Muslim – is much younger, on average, than the population in other regions. The median age in Muslim-majority countries in sub-Saharan Africa in 2010 is just 17; in non-Muslim-majority countries in the region it is 19. By comparison, the median age in all Muslim-majority countries worldwide is 24, while the median age in non-Muslim-majority, less-developed countries is 27, and in more-developed countries it is 40. 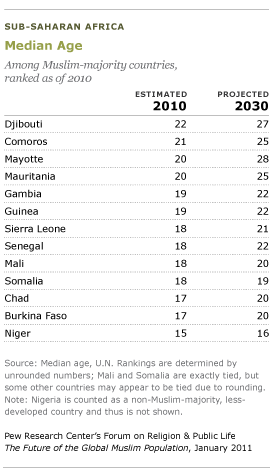 Among the Muslim-majority countries in the region, Niger has the youngest median age (15) in 2010. Mayotte (a small island territory in the Indian Ocean near Madagascar) is expected to have the largest increase in median age (eight years) over the next 20 years. Muslim-majority and non-Muslim-majority countries in the region have similar age structures. In the region’s Muslim-majority countries, about 45% of the population is under age 15; in non-Muslim-majority countries in the region, roughly 42% of the population is in this age group. These percentages will drop somewhat by 2030, to about 39% in Muslim-majority countries and to approximately 36% in non-Muslim-majority countries.